Many snack options tend to be high in fat and salt and provide more calories than we need. Fortunately, Isagenix Whey ThinsTM are now available in Europe to make savoury snacking easy and nutritious. These delectable light-bites provide a combination of high-quality protein, healthy fats and carbohydrates in tasty, crispy crackers. Keep reading to learn our top five reasons for adding these in your next order! Whey Thins are portioned into convenient 100-calorie servings. This can help to provide us with a nutritious, savoury snack without consuming too many calories – just enough to keep you feeling full until your next meal. Looking for something savoury to help you through your Cleanse Day*? Whey Thins have arrived! Depending on your own personal needs on Cleanse Days*, having a bag of Whey Thins and snacking on a few at a time throughout the day can be just enough to tide you over – and satisfy the need for something salty or savoury. Use Whey Thins in place of something else, rather than in addition to your normal Cleanse Day* snacking. As long as your snacking choices don’t lead you to over-consume total snacks during your Cleanse Day*, then it shouldn’t affect your results. Customising Cleanse Day* snacks should be whatever is right for you. There’s multiple ways to snack on a Cleanse Day*, and you might find that you like mixing it up from time to time! For many people who avoid certain allergens it can be a challenge to find nutritious on-the-go snacks. Whey Thins are gluten free and soy free, so are an ideal choice for healthy snacking! Each serving of Whey Thins provides 10g protein. Protein has a role to play in weight loss and weight maintenance while also being important for muscle maintenance and growth, so Whey Thins are the perfect snack whatever your goal (1). That’s why you’ll find Whey Thins in our Weight Management and Energy and Performance Packs. Choosing protein-rich foods as snacks can help us to feel full, which can also help to control how much we eat at the next meal. These foods also have a greater thermic effect, which means that more energy is required to digest, absorb and metabolise snacks rich in protein compared to carbohydrate or fat (2). Packed with high-quality undenatured whey protein, Whey Thins help to keep hunger at bay which can help you to achieve your weight-loss goals. 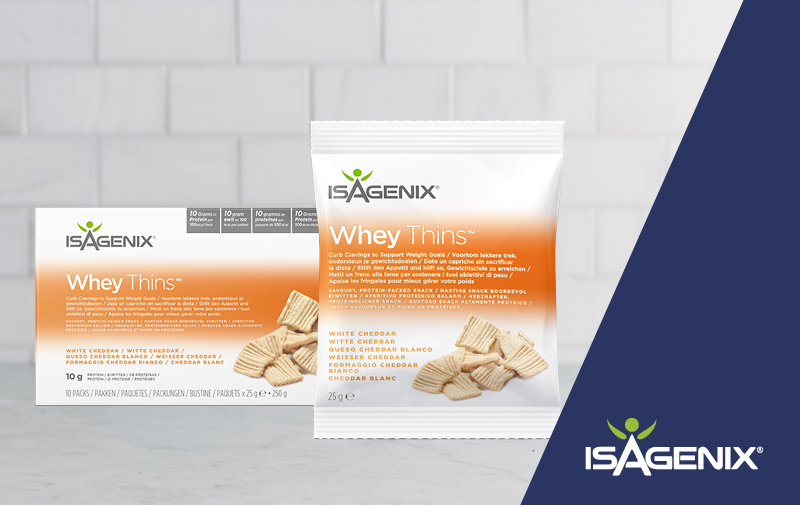 The combination of high-quality protein, healthy fats, and carbohydrates in Whey Thins helps to support weight loss and lean muscle maintenance. Including protein-rich snacks between healthy, balanced meals can help you to achieve your weight loss goals or help to provide protein after a workout.